Originally published under the title, "Hamas in Turkey: 'Humanitarian Activity'." 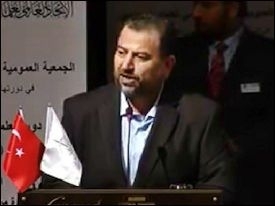 Hamas leader Khaled Mashaal addresses the AKP regional party congress in Konya, Turkey, in December 2014. In 2012, Abdullah Gul, then President of Turkey, when asked by reporters whether Hamas would open an office in Istanbul, said: "Contacts [with Hamas] continue. Time will tell where the dimension of our cooperation will lead us to." Gul is a moderate Islamist compared to his successor as President, Recep Tayyip Erdogan. Guess what time told. Eight years after the 2006 visit to Turkey of the head of Hamas's political bureau, Khaled Mashaal, the Islamist organization -- deemed a terror group by Egypt, the United States, Australia, Canada, Israel, and Japan -- was coordinating its efforts in the West Bank with logistical support from a command center in Istanbul -- a fact that annoyed even the Palestinian Authority (PA). In 2014, Turkey was also host to Salah al-Arouri, a Hamas commander whom the PA accuses of planning multiple attacks against Israeli targets. The scope of Hamas's activity in Turkish territory is an open secret, though Turkish officials claim the nature of that activity is humanitarian. The newspaper Israel Hayom calls Arouri "an infamous arch-terrorist believed to be responsible for dozens of attacks against Israelis." According to the Israeli media, the Israeli Security Agency (Shin Bet) has evidence that the deadly attacks against Israelis were planned at the Hamas headquarters in Istanbul. In November, the Shin Bet reported the arrest in the West Bank of members of a cell preparing to attack Israeli targets, who had received military training abroad under the leadership of Hamas in Turkey. Last August, speaking at the World Conference of Islamic Sages in Turkey, Arouri admitted that Hamas was behind the "heroic action carried out by the al-Qassam Brigades, which captured three settlers in Hebron." The three teenage boys were kidnapped and murdered by Hamas operatives, an incident that triggered the spiral of violence that led to the vicious 50-day war in Gaza. In December, Israel's Defense Minister Moshe Ya'alon asserted that Hamas operatives in Istanbul were plotting terrorist attacks to be carried out in the West Bank and Gaza. "Hamas," he said, "is trying to build terrorism infrastructure in Judea and Samaria that will carry out attacks in different forms, and we must work aggressively and determinately against this." Ya'alon also claimed, when he met with then-U.S. Secretary of Defense Chuck Hagel in Washington, that Hamas moved its bureau from Damascus to Istanbul for the first time in late October 2014. His accusations came a month after Israel filed a complaint with NATO for Turkey's role in supporting terrorism by harboring and supporting Hamas officials. The complaint specifically mentioned Arouri, who has lived in Turkey since 2010. Also in December, a Hamas leader, speaking to WorldNetDaily on condition of anonymity, confirmed that his organization was using NATO member Turkey as a base for logistics, training and planning terrorist attacks. When so much was in the public domain, the U.S. administration shyly felt compelled to act, and appealed to Ankara to prevent Hamas's military activity originating from any base on Turkish soil. After all, Turkey was a NATO ally and most allies viewed Hamas as a terrorist organization. Turkish diplomats and security officials neither deny nor confirm that Hamas has a logistical hub in Turkey. "Call it a bureau or anything else," said one official privately. Another senior official weighed in: "Hamas' activity in Turkey is limited to coordinating humanitarian aid and media work." A recent report in Al-Monitor quoted a Turkish diplomat as saying, "Turkey has a dialogue with Hamas but will absolutely not allow any terror organization to operate on its soil." That line is where verbal "creativity" comes into the picture: "Turkey will not allow any terror organization to operate on its soil." Yes and no. Yes, because Turkey openly declares that it does not view Hamas as a terrorist organization. And no, because Hamas is in fact a terrorist organization. In January, Turkish Prime Minister Ahmet Davutoglu said: "For us, Hamas is not a terror organization; it has never committed any act of terror." But that was not Ankara's first sleight-of-hand for an entity that vows to kill every last Jew on earth. President Erdogan has repeatedly described Hamas militants as "freedom fighters." In December, Davutoglu hosted Mashaal at a high-profile party congress in Konya, Central Turkey. Taking the stage at the event, Mashaal congratulated the Turkish people "for having Erdogan and Davutoglu." Thundering applause, Palestinian flags waving passionately and thousands of AKP fans shouting, "Down with Israel!" The scope of Hamas's activity through Turkish territory is an open secret. Hamas and Turkish officials claim the nature of that activity is humanitarian. Maybe. But in the real world, kidnapping Israeli teenagers and hitting Israeli cities with rockets might actually be considered a "humanitarian activity" by most Islamists, whether Palestinian or Turkish. The choice of Istanbul to host the Hamas bureau is not totally irrelevant: Tens of thousands of people in Istanbul take to the streets in the great metropolis every year to commemorate "Jerusalem Day," in which they customarily burn Israeli and American flags and chant, "Down with Israel, down with America!"